I have had my land erased from me, he is being erased from his own land. When I was younger my family called my Raimie—a British name. When I first went to India I started going by Rajiv, my Indian name my parents gave me. I wandered my traditional fields feeling out for the calling of where they buried my ancestors’ navel string. Bryan refers to himself as Kamaoli when he speaks Hawaiian. To ally I must pectoral slap and fluke thrash against the ideas of “ally” and “settler.” These are convenient terms—they should be verbs. To ally: an action. It must be intoned in active voice. These terms don’t hold the complexities of identity in assemblages—but they are a place where I can start my migration. I come from a group of South Asians who were indentured to the sugar plantations in the West Indies. My family has been outside of India for 120 years. I consider the traditions that I have lost due to colonialism and cultural erasure. The only reason I speak any Hindi or Bhojpuri is because I learned it myself from studying. Would my ancestors even recognize me if we sat together around a hukkah or a thali? Would they laugh as I strain through Bhojpuri? It has been so long and there is no one land that belongs to me. I am of every/no place—walking down the street in Oʻahu, in the middle of the Pacific. 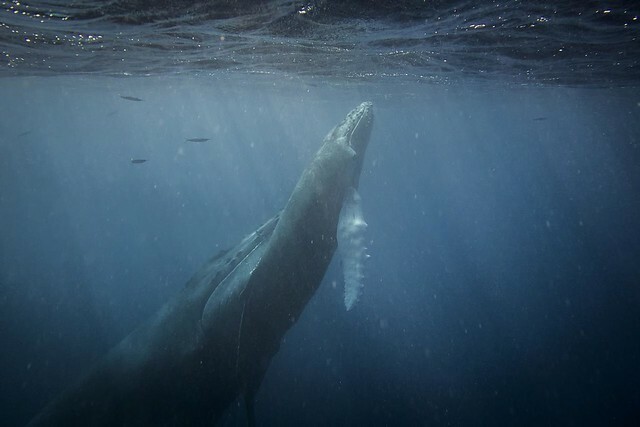 Humpbacks in Hawaiian waters migrate 3500 miles yearly from Alaska to the island archipelago. They migrate and care for the places that they are, singing along the way. Are their songs stories of how to cut through the deep water? Are their songs like roads that they sing in order to follow? Are their songs what keeps them alive despite the devastation of the ocean from plastic, the US Navy sonar, and illegal poaching? Each stopping point an important part of their life cylce. 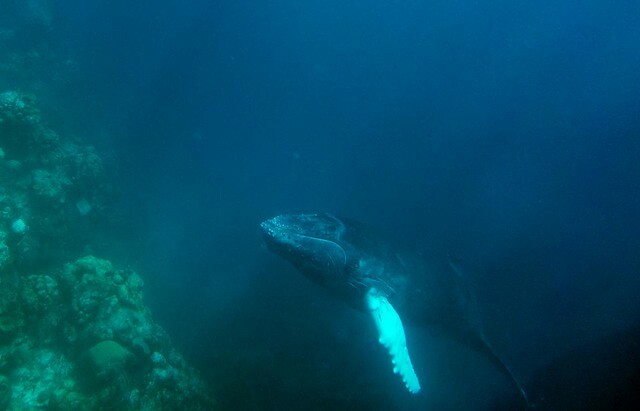 Since humpbacks in the winter months come to these waters, any feeding is opportunistic. They eat only when they can find food. They don’t hunt and kill where they can’t—where they don’t need to. They’ve stored up enough fat by the time they come to Hawaiʻi. Do their songs tell them how to use their resources sustainably? In Hawaiʻi they calf. In Hawaiʻi they breed; meet to sing. The one drop rule makes you Hawaiian, one drop of Hawaiian blood and you can claim Hawaiianness: i.e. there are no “authentic” Hawaiians. First of all, your notions of “authenticity” need updating. Frankly it’s racist and I don’t need to explain why. Why should Hawaiians fit your descriptions of racial categories? Why can’t this be up to individuals and communities? Being Hawaiian and claiming an identity is an act of resisting erasure. Like their being erased from the land, you are trying to erase people from their sense of self. This is textbook settler colonial practice—the logic of elimanation. By making this claim you are trying your hand at genocide. The constrcution of the “indigenous” person is a colonial appelation and measure. This may very well be the case—the word for a Hawaiian person is Kanaka Maoli. Say it. Kanaka Maoli. There are material consequences for this colonial and occupational identity category—people are being dispossessed, the Mauna is being desecrated; the government wishes that the Kānaka Maoli would just disappear so they can drain the earth, build high rises, and own the land. Rallying behind what you believe to be a “construct” may be an important strategic moment that will ensure survival of Kānaka and their stories. This may also be an epistomological difference—meaning that to you this is just empy land that needs drills, mines, telescopes, but to the people actually of this place, it is the meeting place of Papahānaumoku and Wakea. Identity politics are so boring. If you are not under direct threat of extinction, if the government is not wielding its genocidal harpoon aimed at your heart, then your point is invalid. Knowing that categories of “race” are problematic and “constructed” does not mean that there are no material consequences as a result of this kind of thinking. The consequences from dispossession are substance abuse, diabetes, being murdered in the streets by government officials—think of the Elderts and Deedy situation and countless others—etc. But Hawaiian poetry is just not good. You are not willing to listen. How will you know a poem’s importance if you are deaf to people’s concerns? Why come to poetry if not to be moved? Hawaiians are anti-science and therefore in need of the helping hand of Western influence. First of all this is not solely “Western influence.” Keep in mind that funding for the TMT is coming from China and India as well. Secondly, it’s funny how issues of modernity are harnessed for justification of settler practices. Modernity itself is colonial. I’m not saying that science as such is stupid—I’m saying that science is an epistemological framework that does not take into account that the Polynesians were expert astronomers and didn’t need Thirty Meter Telescopes to navigate the entire Pacific ocean. Why should they, or any of us for that matter, trust any epistemology like “science” when it was only recently said that people with skin like mine are human? Why should we trust a system wholly that doesn’t allow for diversity of expression or worldviews? How is this not a colonial measure? But I’m tied to the land too—my family has been here for generations. It’s like that for me as well, being from a community in South America of Indians from India in a land that been erased of its natives who are actually still there and resisting the colonial state. We have worked the land with our indenture and labor. But to say that there was no one else who was affected would be the opposite of making space for marginalized voices. Isn’t it more important to recognize subaltern histories, to let people be, instead of insisting on their extinction? From what I know and from what my friends say, Hawaiian sovereignty means nothing about ethnic cleansing of Hawaiʻi after independence. You are thinking of American and European practices of state sponsored genocide. Look. It’s true: Hawaiʻi is illegally occupied and the US government is still trying to control native land. But the word “settler” doesn’t quite allow for nuance and it gets people’s backs up. What does it mean for me, someone with this history of colonization, cultural erasure, and missionization to come to Hawaiʻi, a country under illegal occupation by the United States and not mimic colonial and settler ways of interaction? What does it mean to be an ally to the Kānaka Maoli when I represent the American government as a graduate student at the University of Hawaiʻi—that institution termed “a Hawaiian place of learning” still practicing settler colonial tactics of terra nullius vis-à-vis the Thirty Meter Telescope? This is a hard lesson for anyone who wants to do good, who wants to support, who wants to be part of the conversation. How can we open our hearts? How can we let our egos go long enough to read the “I’s” of the people around us who are standing up against the occupation and destruction of Empire, of colonial violence. It’s not my needs that need to be met in allying as an action. How can I, from the outside, sing with my friends? To ally I must first listen to the songs around me. To ally I must be willing to cultivate a beginner’s heart. To ally I must first learn the song. To ally I must be willing to make mistakes and learn from the people around me. To ally I must listen to what my friends tell me about aloha ‘āina. To ally, I must listen first, then I must be changed. Humpback whales have to meet up before they start singing together. But it takes time. One whale sings and another whale sings back. One whale must learn from the other whale’s song and sing back. I do not need to own land here. I am not anything but the face of colony, though myself bred out of my heritage. My fatherʻs American flags and assimilationist mentality are scars in white, in blue, in red. I am responsible to the earth of where I am—myself, a diasporic poetic; migratory, cetacean. I have spent a lot of time feeling sad about how my parents have tried to erase us culturally just to fit into the North American landscape. How the songs I sing are fragmented and a patchwork of threads I’ve had to uncover in books in the library. Will I ever be whole—be able to speak to my ancestors in a voice they can recognize? Considering this while walking through Mānoa: on the ground a small green mango had fallen into the dirt from a tree. I looked at its shine and thought of how I would dry its flesh and make achaar, pickle. How sweet it would taste, a Hawaiian mango in coolie spice. My impulse: to unite the place I am with the places I am from. The mango is in Hawaiʻi. To ally I must allow for its history and learn from it. I can also add my masala and spices. I laughed. What exactly is missing in me? To ally I must make space for Kānaka Maoli when I have the privilege of controlling a space. To ally I must take risks. To ally I must breach expectation and spray the world with poems. I meditate on this often so much in fact, because at every turn it seems that people of color voices are still suffering from lack of representation and increased pressure to assimilate or to be erased. In my own practice of writing, I see my first person as an assertion against empire, a way to un-erase memory, a decolonial act. How can a brown queer speak? Whales are beautiful to me and I can’t articulate exactly why. I cannot capture every shade of meaning or the way my spirit leaps into the sun when I see one. I am teaching a poetry class at the University of Hawaiʻi, Mānoa, in which I ask the students to pay attention to the use of the first person, noting why it’s important and how it shifts through collections. This follows the heels of Cathy Park Hong’s essay “Delusions of Whiteness in the Avant-Garde” in which the poet talks about anti-identity politics in poetry stands for white supremacy. To not have an “I” is to not exist in the fabric of the poem. When people claim to be anti-identity in poetry and writing in the institution of American poetry, what they do is erase indigenous folks and people of color. Today, workshop as usual: the students bring their poems in for critique by their peers. Joslyn Sam wrote a poem in which she sends her aloha ‘āina to those who resist and are resisting further desecration of their land. Mauna a Wākea is sacred. She uses chants from the mountain to let her kūpuna know that she is listening, that her friends and family are gathering, that they see the sky, the mountain, the snow, that she is: beyond desecration. Here is a song. To ally I must listen and make space. The class stands with her as she read her poem. Her voice shakes. Her ancestors speak with her. kū, e nā kiaʻi mauna! ʻo lākou kāu mau kauā! rise, protectors of the mountain! yes, we are here! we are here, Poliʻahu! we are your humble servants! No Poli’ahu from rajiv mohabir on Vimeo. I go back to Waimea wanting to hear what I missed last sunset. The humpback streamings connect me to this place. Under water I look up at the sun. The sun, the clouds pattern formations in the ripples the sand does in its seabed. Pulled by ti(d/m)e. I am caught in an aqua aura. I swim in whale song. Clear voices croon across the deep. I point my head to the sea floor and stretch out my arms. Their voices louder now. Their voices reverberating through my throat and body. I cannot help but be transformed.